Confluent Design was retained by the City of Longmont to lead a large, multidisciplinary team to update the St. Vrain Greenway Master Plan and prepare construction documents for Dickens Farm Nature Area, a nature-focused 67-acre park located two blocks from downtown Longmont. Our approach was to find synergy in the sometimes-competing objectives of recreational development, habitat restoration, and floodplain management. The end result was a program and site plan that fully integrated conservation and habitat restoration (aquatic and terrestrial) into the recreational development of the park and economic development of adjacent property. 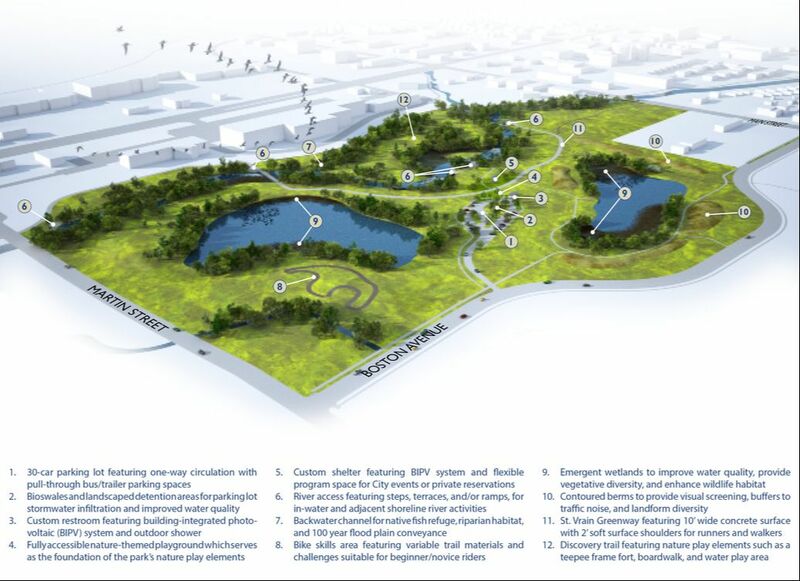 At the core of the park and its vision lies a new river park where poorly-reclaimed gravel ponds once existed. Originally conceived by the City as a traditional whitewater park, the river park evolved in concept through the lengthy public process to become a family-friendly, low-velocity stream channel designed to accommodate a diversity of water-based recreation activities. The creek channel was designed to improve aquatic habitat for three sensitive native fish species. Wetlands were constructed along Spring Gulch to improve water quality before discharge into St. Vrain Creek. Expansion of riparian, wetland and grassland habitats was integral to the design of the new park; only one acre will be irrigated turfgrass. The property was heavily impacted by the 2013 flood and the entire project was redesigned to accommodate the recalculated 100-year discharge of 15,500 cubic feet per second. The river portion of this project was completed in 2018 and the remaining park is in the bid documents phase with construction starting in early 2019. This project is the 2018 recipient of the Sustainability Award from the American Public Works Association (APWA), Colorado Chapter. Scope of work included master planning, public engagement, natural and cultural resource investigations, ecological design, hydraulic modeling, construction documents, cost estimating, and construction period services for earthwork, utilities, parking lot and trails, custom restroom and semi-custom shelters, grassland and wetland restoration, irrigation, and amenities.